This flexible yet durable vinyl is ideal when you need a tough product, but you need to be able to shape it as well. Cut, sew, or tape this vinyl product to create a more flexible window covering. Use 30 gauge vinyl as a flexible alternative to 40 gauge vinyl in boat windows, clear curtains, or protective coverings for outdoor gear. Cut it, sew it, or tape it together and it will last over time. Our clear vinyl lets the light in and keeps the weather out. Wipe it with a damp cloth, and it looks as good as new. To use on Cedar Porch, that is heavy enough to withstand -20 something degrees! Need to cover firewood stands and like the cold temperature rating. Hope it works. To enclose my screen porch in order to protect from pollen and weather. To use as a windbreak for the chicken run. Closing in my patio so I can keep using my inflatable hot tub this winter. To cover my porch, I also plan to use material when I build my green house but I have to see what the material looks and feels like. You have excellent price, free shipping and Maker's money! I have the northside windows of our screened-in porch that I'd like to close up to the wind, but keep the visibility. This ought to do the trick. Used this before around chicken run for winter and was very pleased with it. Held up well in cold Wisconsin winter. Adding rain screen to the back of our boat's bimini. Protecting the door from dog scratches. Purchased from this company before. Quick easy checkout and delivery to Canada(Ontario). Excellent product received as described. To cut into square or rectangles for furniture protection: my cats! I make clear tote bags and this is a little thicker than the vinyl that most people use. It makes a great bag and stands up by itself..This is my first time ordering from you and your prices are great! And free shipping! We are going to use this to wrap around the bottom of 2 work tables to keep out the dust in our pattern/model shop department. I chose this 30 ga clear vinyl to cover my windows with in winter in the north east. Were covering workbench in my husbands shop to keep oil etc off. We use the thicker kind of plastic to cover the dining room table. Could not find anywhere else. I am looking to use this product on our screen porch to keep out the rain and snow. Based on the product details and reviews I think it will be exactly what we've been looking for. I used this last year to shut out the winter wind and snow on my front porch. Strong and clear. Had to buy again because I had to cut up last years for another project. Will not do that again. to winterize bunny hutch / chicken coup. Choose to protect my antique dinning table. I wanted to make a walk thru door for an alcove in my garage. This looks to be the best option. Needed a thick sheet for splash protecting on a machine. Great quality ,good price,very pleased with finished product,Replaced enclosure windows in porch.Going to weather proof other windows and doors around beach house without loosing sunlight.Love it!! durable, easy to manage, use for a dog house curtain. but very good for many uses. This should be a good choice to help insulate several single pane windows in my heated garage. Will also use to install a small window in a boat cover. I am buying this item to use as a dog door. Do these vinyl turn yellow when exposed to sun light? BEST ANSWER: No, this vinyl doesn't yellow. What gauge to enclose a porch for the winter? BEST ANSWER: You can use pretty much any gauge. It depends on how you're planning on enclosing the porch. For thicker options, try 30 or 40 gauge. The 30 is a little thinner and more flexible, and the 40 is a bit thicker and stiffer. They're rated for temperatures as low as -29 and -30 degrees respectively. We suggest ordering samples if you want to compare different gauges. We used the 30guage. It was easy to work with and stays clear. I have several Questions on the 30g. 1) How hard is it to sew with a regular home type sewing machine and is the 16 needle that you pointed out in the 20g still OK or do I need a larger one and a commercial sewing machine ? 2) What type of thread would I need if I have to sew seams. 3) Should the seams be folded over like doing regular material seams? 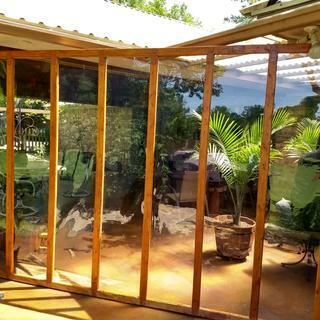 4) Do you also sell design ideas for closing in a screened porch and such? 5) Do you sell the hardware needed to close in porches? How you do the seams depends on what you're making. For a screened porch, overlapping the edges and sewing would work, but if the pieces are too big to fit, a regular seam is fine. We don't sell anything else related to screen porches. Good luck! 1. easy to sew on a regular machine, use tissue paper under the foot. 2. You will need 90/14 universal needle, reg sew machine. 3.thread type should be used for outside if using there if inside, cotton thread or polyester. what is gauge compared to ml? Would this stick to clean glass car windows without using an adhesive? BEST ANSWER: This gauge is too heavy to stick. The thinnest clear vinyl, gauge 4, sticks, but I can't say how long it would stay. You can order a sample if you want to try it out. Thanks, I'll order a samplee. Can dry erase marker be wiped off if used on the 40 gauge clear vinyl? Or does it absorb the ink and leave a stain after it is wiped off? BEST ANSWER: Dry erase markers are fine on this product, there is no stain left before when wiped off. Some residue may remain but you should be able to use a damp cloth to remove it. If I buy 3 yards is that one continuous yard.? BEST ANSWER: Yes, you should receive 1 continuous piece. I want to cover the lower portion of my screened in patio to prevent my small dog from tearing the screening material. Will this product withstand a dog's claws if he were to stand and put his paws against the material. Also, what would be the best means to affix the material to the upright supports between screen section? BEST ANSWER: This clear vinyl is thick enough that it will stand up well to a dog's claws. It can be stapled with a heavy duty stapler. We recommend ordering a sample to be sure that it will work for your project. what is recomended gauge for window replacement on Miata top.It measures 35x16.5 ??????? BEST ANSWER: I recommend a 30-60 gauge vinyl. Here is a product guide on our clear vinyl that should help you https://www.onlinefabricstore.net/makersmill/clear-vinyl-fabric/. I also find it helpful to order samples if you are still unsure. What is the thickest gauge I can use for dining room table? What gauge is best for taking the place of glass for framing pictures? BEST ANSWER: 30 gauge would do it. Will it keep the cold out on my windows ? BEST ANSWER: I used the 30 gauge vinyl to replace the windows in a customers yurt. I also made a cover for a scooter for an elderly man. He said it really kept out the cold and rain so i would think it would help with keeping the cold out of your windows. Looking to redo the clear vinyl enclosure on my boat. Guessing the 30 gauge would work, will this work with a salt water environment, also are u able to clean with a micro towel and fresh water daily if needed, without scratching. Do u have samples I can purchase to look for the best gauge ? BEST ANSWER: Yes, this clear vinyl will work as you describe. We have samples available for all gauges. To add a sample to your cart, click the "Add Sample" button near the "Add to Cart" button for each gauge you would like. BEST ANSWER: Yes, clear vinyl can be used this way, but you would probably need a thinner gauge like 6 or 8. Do you sell full rolls of vinyl? BEST ANSWER: We do. For large quantity orders we recommend contacting customer service to place your order. How long this product Least on the outdoor weather? BEST ANSWER: I made windows for my tree stand out of this and put the in over a year ago. They are still good. It's a great product. I am going to make storm windows for my house with this. I got hardwood floors I’m looking for something to protect them in my dining room from my 4 dogs when they make mistakes in the house before going out side ? BEST ANSWER: We do not recommend this be used on floors as it poses a risk of slipping. will this work as a pet door? BEST ANSWER: It could. We recommend ordering samples of several different gauges to determine which thickness is best for your needs. If I order 1 yard, would it be 54" x 36"? What thickness is appropriate for a doggie door? BEST ANSWER: It really depends on personal preference, you want it to be thick enough so that it will close but not too thick that it won't bend easily. We recommend ordering samples to see which will work for you. Would this work to cover a chicken run for the winter? BEST ANSWER: Yes, it would. We recommend ordering a sample to be sure that it will work for your specific project. I NEED 72" WIDE HEAVY GAUGE VINYL, ANY SUGGESTIONS? BEST ANSWER: We only offer 6 gauge in 72" wide, it may not be heavy enough for you. BEST ANSWER: The 6 gauge clear vinyl comes in a 72 inch width, but we don't currently have wider choices for other gauges. Is this good for greenhouses. does it let right light in ? BEST ANSWER: Yes, it is commonly used for greenhouses and is completely clear to let the light in. I want to make job jackets for 9x11 printer paper ,I have/ use homemade clear vinyl for serger covers that are 000.46 thick and want the same or close as this, my boss used a gage to measure this thickness, why aren't you guys actually measuring the thickness? it would make choosing much easier. BEST ANSWER: We do have the thickness available in the details section. This particular gauge is 0.030" (±5%). Is this gauge of vinyl flexible enough to form into a funnel ? If not, what gauge do you recommend? Thanks. BEST ANSWER: Yes, this gauge should work. We recommend ordering a sample to be sure that it will work for your project. Is it safe on a Black Lacquer Table from China? BEST ANSWER: Many people use clear vinyl to protect their tables. Please be aware that heat or moisture may alter the surface of your table with this vinyl on top. BEST ANSWER: We've never used it that way, but 16 or 20 gauge would probably work. We recommend ordering samples to see what will work for your project. What gauge vinyl is used for covering dinning chair seats? BEST ANSWER: We'd suggest the 6, 8, 10, or 12 gauge. Any of these are flexible enough for covering dining chair seats. We recommend ordering samples to see what will work best for you. Is this sized 54" times the number of yards ordered? I am really liking this vinyl so far. I made a structure of 1x3 lumber and pinched the vinyl in between. The structure was 7 feet by 10.8 feet. I want to block wind at certain times, especially in the winter. Works great around chicken run and screen porch. Stays clear so you can still see through. My wife and I enclosed our screen porch in order to be able to use it in the winter. It will also keep the Spring pollen from coming in and causing constant cleanups. After the pollen is gone we will be able to open in up again within a short time and use it as a screen porch. The 30 gauge clear vinyl is just what we needed. Just a matter of removing some screws and washers and We will be able to do it again next Winter. Very good quality vinyl and ships quickly. It is perfect. I bought the 30 gauge clear to enclose a porch and it definitely keeps the enclosed portion free from rain, snow and even has some sound deadening qualities. It is not heated but is noticeably warmer with the enclosure. Needed vinyl with a bit more "heft" that the materials available at my local fabric store. Glad to find it online and at a reasonable price. Great product and quick shipping. Very versatile material- we use it in a printmaking technique. This product is just the thickness I need for shielding the bottom of my workbenches from wood dust, and whatever else flies in the air. My only disappointment, and it's my own misunderstanding, but I was hoping it would come in rolls 36" tall, instead of 54", then it would have been perfect height. But it was only a matter of a few more cuts. I would recommend.